خطأ لوا في وحدة:Location_map على السطر 501: Unable to find the specified location map definition. Neither "Module:Location map/data/Japan Kansai" nor "Template:Location map Japan Kansai" exists. 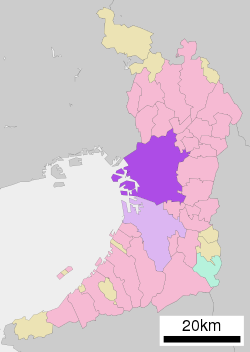 اوساكا (يابانى:大阪市) (انجليزى:Osaka), ده مدينه يابانيه, عدد سكانها 2,668,586 انسان. ↑ "Historical Overview, the City of Osaka official homepage". Archived from the original on March 22, 2009. Retrieved 2009-03-21. Navigate to the equivalent Japanese page (大阪市の歴史 タイムトリップ20,000年 (History of Osaka, A timetrip back 20,000 years)) for additional information.